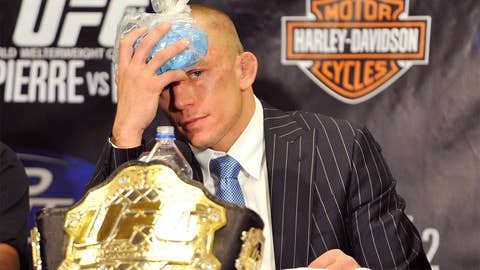 Georges St-Pierre, the most dominant welterweight in UFC history, announced his hiatus from the UFC. Georges St-Pierre is going away for a while and he’s not sure if he’ll ever return. The UFC welterweight champion will be giving up his title and leaving the organization for an indefinite about of time, he announced Friday during a media conference call. GSP, who has held the belt for six years, never mentioned the word ‘retirement’ and left the door open for a potential return in the future. "One day when I feel like it, I might come back," St-Pierre said. "But right now I need a break." With St-Pierre gone, the UFC’s welterweight division will move on without him. Johny Hendricks will fight Robbie Lawler at UFC 171 on March 15 in Dallas for the vacant title, UFC president Dana White said on the conference call. One day when I feel like it, I might come back. But right now I need a break. "I don’t want to make nobody wait," St-Pierre said. "I want to [come back] when I feel like it. I’ll become stronger when I will. It has to be up to me. It has to be on my terms." GSP, 32, repeatedly said he needs to get away from competing and lead a ‘normal life.’ He still plans on training at Tristar Gym in Montreal and helping the fighters there prepare for their bouts. But he will no longer have to deal with the ‘pressure of competing,’ which he becomes obsessed with. White said it’s more about St-Pierre’s personal issues, which GSP refused to speak about on the card, much like he didn’t after beating Hendricks at UFC 167 when all this speculation began. All St-Pierre would say Friday about it is that his personal life is "like a freakin’ zoo." "You can tell by the way he talks that the issues he deals with outside the Octagon are driving him nuts," White said. "He’s obsessing about them and they’re driving him crazy." St-Pierre said if he never returns he’s satisfied with his legacy and how he attempted to elevate the sport of MMA worldwide. White added that GSP is the greatest welterweight of all time. And if he does return, St-Pierre said he’ll come back better than ever, ready to win the belt he’s about to give up once again. "I love my sport," St-Pierre said. "I’ve never been a victim of anything. I choose this life. Nobody ever forced me. As much as I choose to do it, now I choose to not do it. It’s my life."